Data Type : Define the type of field for the application. When it is defined as a Time, it is allowed to define the format of the time. 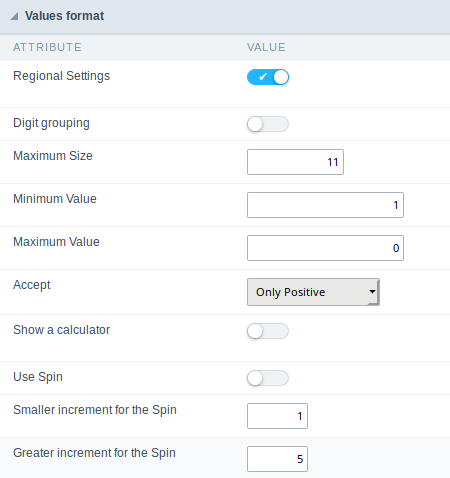 It allows you to apply regional settings to the number fields formating. When this option is not selected it will be displayed the attributes group, minus sign and negative number format. It allows you to define if the field displays the digit grouping separator. It allows you to define the maximum size that will be used in the field of the application. It allows you to define the minimum value that will be used in the field of the application. It allows you to define the maximum value that will be used in the field of the application. It allows you to define which character is used to separate thousands. This option is only available when the option to use regional settings is disabled. It allows you to define which character will be used for the display of negative numbers. This option is only available when the option to use regional settings is disabled. It allows you to define the placement of the negative sign in relation to value. This option is only available when the option to use regional settings is disabled. It allows to define if the field accept only negative values, positive-only or both. This option when enabled will display a calculator to assist the end user to perform calculations. This option applies a Spin component to the number field. So the end user can increase or encrease the numbers using it. You will also be able to set a minor or major range for the spin. Sets the minimum range of the Spin component. Sets the maximum range of the Spin.